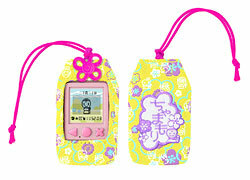 Kids who want to walk around Japan now have a way to make their dream come true with Chamamori, a toy that combines the features of a pedometer (a device that measures how many steps you take) and a handheld electronic game. The new toy is particularly popular among girls. Gamers start their journey by choosing a departure point from among Japan’s 47 prefectures and attaching the Chamamori to their bag or clothing. Each step taken in real life becomes a certain distance covered on their journey. In time they reach the next prefecture, and then the next, and so on. The more they walk, the closer they come to reaching their goal of traveling around the country. Accompanying them on their trip is a character named Chama, who looks like o-jizo-sama, a deity who is believed to help people and travelers in need and to protect children. Statues of o-jizo-sama are found along roadsides throughout Japan. The name Chama derives from the “sama” of o-jizo-sama. In the game, each prefecture has its own Chama modeled on a local specialty or character. 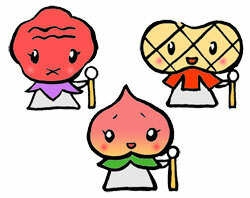 Wakayama Prefecture, for example, has a Plum Chama whose face is shaped like a pickled plum. Okayama Prefecture has a Peach Chama, and Chiba Prefecture has a Peanut Chama. Each Chama has a unique design, and meeting them is a big motivator in the game. Many Japanese people carry around an amulet known as o-mamori, which is where the last half of the name Chamamori derives from. O-mamori are sold at shrines and are believed to bring good luck and ward off evil. Some are said to bring household safety, while others are said to bring success in exams, recovery from an illness, or some other goal. Chamamori toys come in a small, attractively embroidered bag resembling o-mamori, and they look nice when hung from a backpack or bag. The game comes in four colors, each with its own significance. Yellow, for example, is associated with luck with money, and red with vitality. The toy has a variety of fun features. Gamers can go on virtual shopping trips with Chama points acquired by walking and playing games. After finishing one trip, they can start another with a new Chama. 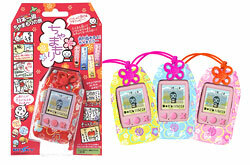 Chamamori toys are popular because they help children to learn Japanese geography and make walking fun.